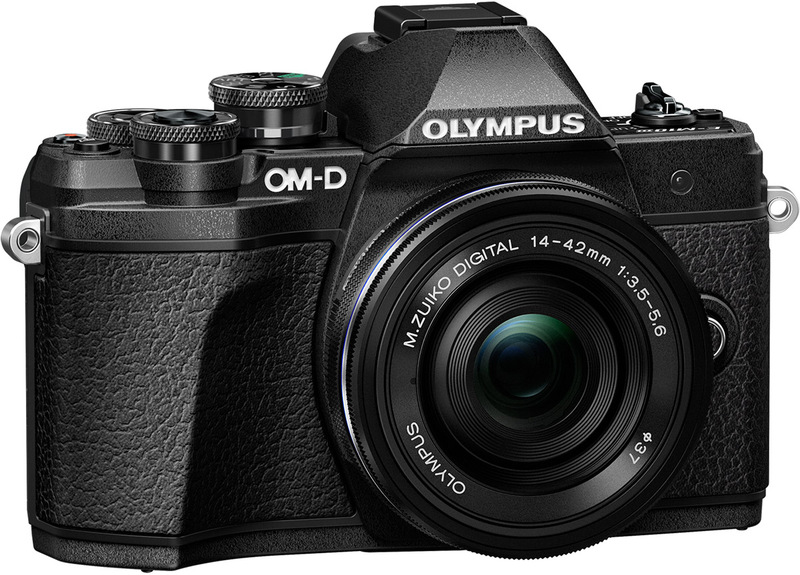 Today Olympus have announced their latest addition to award-winning OM-D series of mirrorless cameras - introducing the E-M10 Mark III. The E-M10 Mark II is a follow-up to 2015's E-M10 Mark II and is a beautifully crafted camera that follows Olympus' classic design standards from days of yore, which makes it a fantastic looking piece of equipment. Inside though, it brings several very welcome updates from the Mark II. The Olympus OM-D E-M10 Mark III is a perfect travel companion - compact and lightweight with UHD 4K video, 5-axis image stabilisation, a faster processor, 121-point Contrast AF, sequential shooting of 8.6fps, tiltable touchscreen, built-in Wi-Fi wireless connectivity, and intuitive, easy to navigate controls. The E-M10 Mark III is the kind of camera that you can take with you anywhere, hop on a plane with it in your carry-on bag, get the perfect shot with access to over 40 micro four thirds lenses, and share your images instantly from anywhere in the world via the Olympus app. The Olympus E-M10 Mark II was renowned for its image quality, producing beautiful images from the 16MP Live Mos sensor. The E-M10 Mark III inherits this same 16 megapixel Live Mos sensor, as well as the same ISO performance (from ISO 200 to 25,600) and the same sensor-shift 5-axis image stabilisation system that provides up to 4 stops of exposure value compensation. Keeping these features consistent from the Mark II to the Mark III means that still image quality will be broadly the same; and considering how good it was in the Mark II - that's no bad thing. One improvement that will have an impact on image quality, however, is the upgrade to the Truepic VIII image processing engine (the same we find in the OM-D E-M1 Mark II) which gives a continuous shooting rate of up to 8.6fps. Here is one of the biggest advances that the E-M10 Mark III has over the Mark II - the upgrade to a 121-point Contrast AF system - a huge improvement over the 81-point system that appeared in the Mark II. With more AF points, the focusing in the E-M10 Mark III is fast and intuitive and works particularly well with the Face Detection mode. Touch AF and Touch Shutter are simple to use and make it easier to lock on focus accurately and precisely to your chosen subject matter. The single biggest difference between the OM-D E-M10 Mark II and the Mark III is introduction of 4K video recording into the camera. The ability to record 4K video on your micro four thirds camera has become somewhat of an expectation these days; and dutifully Olympus haven't disappointed. Whereas the E-M10 Mark II was only capable of recording 1080p HD video, the Mark III will now record at ultra-high definition 4K video at a resolution of 3840 x 2160 at 30 frames per second. The E-M10 III will also shoot Full 1080p HD video at 60p and 720p HD video at 120p for the ability to shoot slow motion footage. 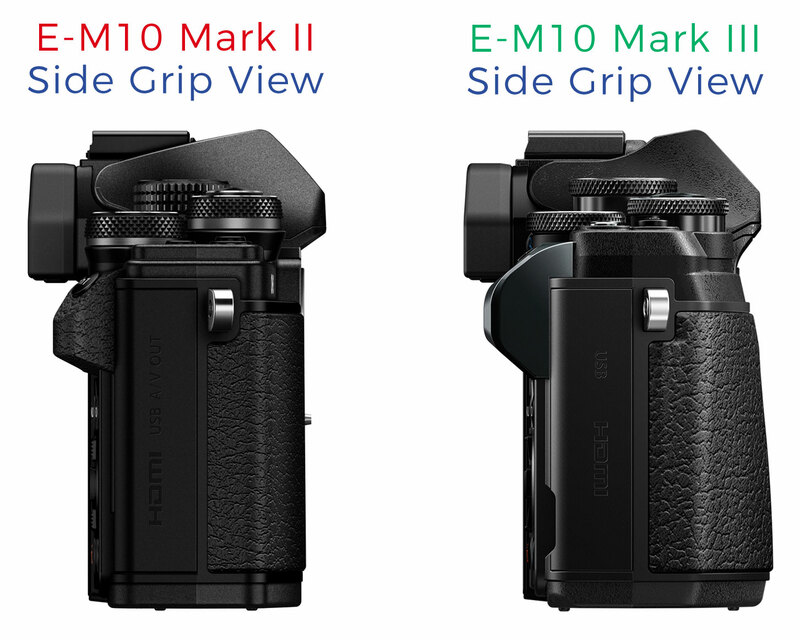 The OM-D E-M10 Mark III's body has been tweaked over the Mark II's, with a deeper hand grip for a more secure hold, improved thumb grip on the rear, and a redesign of the top panel. The redesigned hand and thumb grips makes the Mark III much easier and more pleasurable to hold and use than the Mark II. The grip is only a few millimetres deeper, but it's also tapered and contoured so it's a more natural fit in your hand than the Mark II was. Further redesigns to the body come in the shape of new control dial - the main dial is larger and the rear and front adjustment dials have been reshaped to make them easier to scroll with one finger. 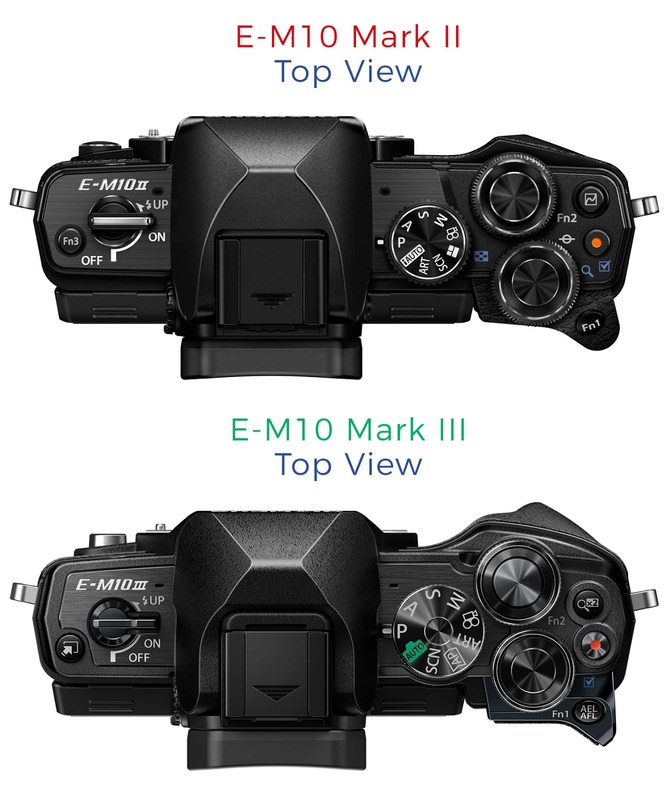 You'll notice that there are two new additions to the top of the E-M10 Mark III - a x2 magnify button and a control panel button. The x2 button adds a digital 2x teleconverter to your images while shooting, which means that if your longest lens can't capture what you need to see, you can use the 2x magnification to zoom in on that subject. Obviously, this is digital zoom so you lose quality in the final image, but it's handy if you just want to get close to something. The other new button is the one-button control that gives you access the Super Control Panel. This touch-operated control panel on the 3.2 inch rear touchscreen gives you easy and intuitive access to a myriad of camera settings and controls that allow you to fully customise your images. This Super Control Panel on the E-M10 Mark III is intuitive and straightforward to use, which makes the camera an absolute breeze to use straight out of the box. On paper, it may not immediately seem like the Olympus OM-D E-M10 Mark III is a totally new camera compared to the Mark II - and it's not. Olympus have kept several of the key features consistent and I can see why - they just work. The image quality from the E-M10 Mark II was fantastic, so why change it? 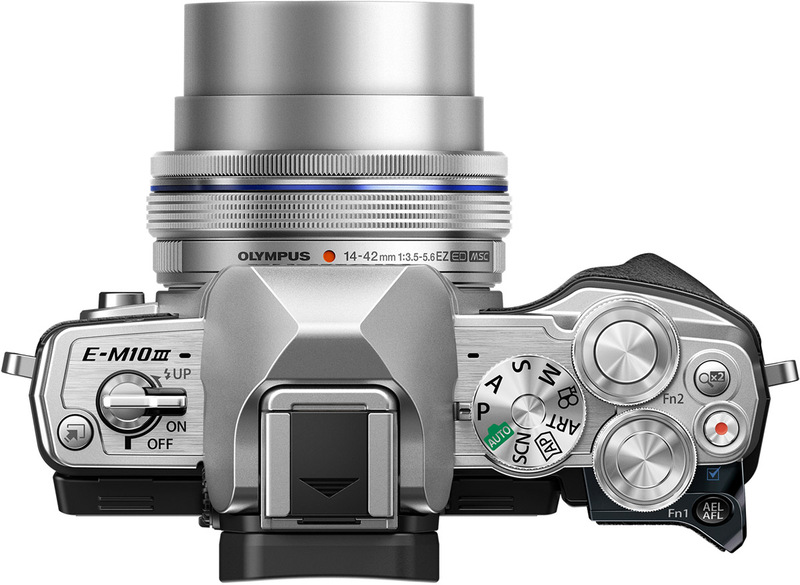 However, where Olympus have made changes means that the E-M10 Mark III is a camera a world away from the Mark II. The introduction of UHD 4K video recording means that the Mark III is brought up to date with the latest technology and can record ultra-high definition video that's rich and full of detail. 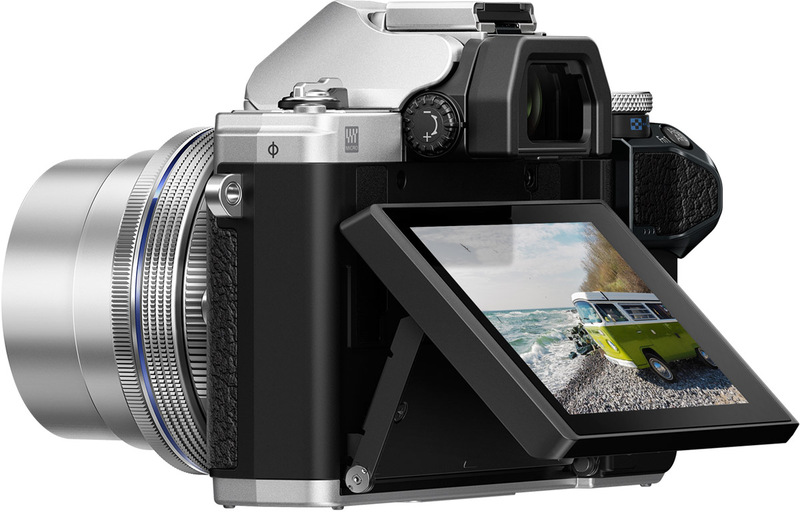 When you combine this with improved focusing, and the Super Control Panel as well as a redesigned outward appearance, you get a compact mirrorless camera that's intuitive, super easy to use, shoots 4K video, high quality 16MP still images, and does this all while looking fantastic with its retro styling - a trait that allows the E-M10 Mark III to sit comfortably in its surroundings, wherever they may be. The Olympus OM-D E-M10 Mark III is available for pre-order today from Park Cameras in both black and silver bodies or as a kit with a 14-42mm EZ pancake lens, or as a kit with a 14-42mm EZ pancake lens and a 40-150mm R ED telephoto zoom lens. Expected to be available from mid-September 2017. "Face Detection"? Really? It's Phase Detection, you pros. Face Detection... it detects faces.